Today, we’re featuring a French bistro classic — the croque-monsieur. The croque-monsieur (also simply called croque) is similar to a grilled cheese sandwitch in the US. 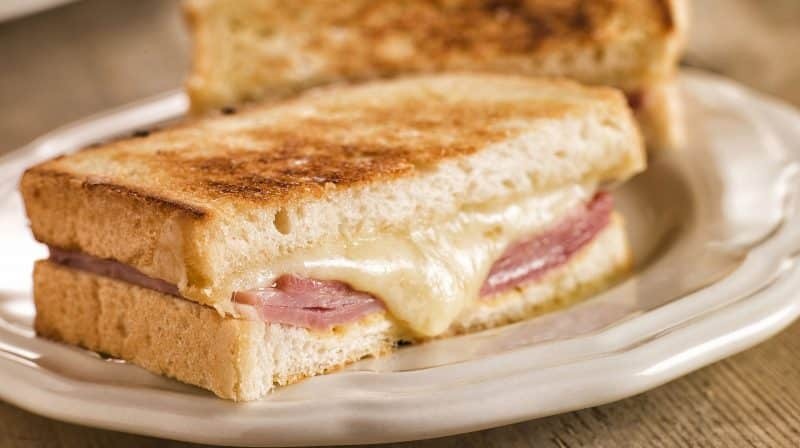 Nobody really knows where the name comes from but literally it means “bite-mister.” It is said that the first croque-monsieur dates back to 1910 when it was served in a Parisian café. A croque-monsieur is as simple as can be and makes for a wonderful quick movie night dinner. They are also great for a quick spring lunch or dinner on the patio. Check our detailed recipe and Art of the Home suggestions below. Enjoy and bon appétit! Stack up the slices of gruyère and cut to the approximate size of the bread. Do the same thing with the slices of ham. Butter up 4 slices of bread and stack up ingredients in the following order: 1 slice of bread (butter side facing up), 1 slice of gruyère, 1 slice of ham, 1 slice of gruyère. Butter up the last 4 slices of bread and place on top of the last layer of gruyère with butter facing up. The butter will melt down into the top slice of bread. Put a sheet of aluminum foil on the center oven rack. Grill in a hot oven for about 10 minutes. During the last 1-2 minutes, put the broiler on high (but monitor closely to avoid overcooking). This will make for a nice color on top and add to the crunch. Serve on individual plates with a green salad if you wish. Cheese lovers: sprinkle shredded gruyère on top of the croque-monsieur before putting in the oven. Cheese substitution: if you don’t have gruyère, you can use emmental or Swiss cheese. Oven alternative: croque-monsieur can also be made on the stove top or in a panini press.